Eat Pray Swim Volunteers! : Eat Pray Swim Volunteers! We need you! 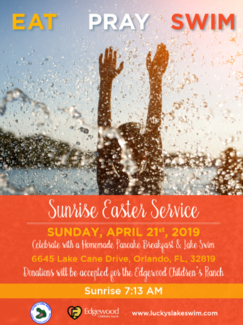 Our Easter Sunrise Service, Lakeswim, and Pancake Breakfast is around the corner (April 21, 7:13AM). We need volunteers in a number of areas. Please take a look at the areas of service and sign-up today! Prayer leading up to the service. You will be emailed the specifics. Grip and flip, serve with verve! I’ll help with breakfast and do whatever is needed. Come early to pack 'em in! You call 6 early! Hrmmph! I talk a lot, plus I tell jokes. Some are funny. Surely, there must be something I can do to help. Grip and grin, "Fill in from the right!" " I can do anything! (If you ask nicely!)"